The 49.9-metre superyacht Moonraker backs up to the dock, her waterjets stirring a cauldron of white foam around her large, teak, stern platform. 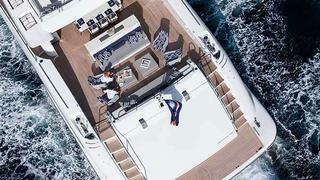 Her built-for-speed lines and the throaty soundtrack are attracting a crowd of onlookers even though there is no shortage of impressive yachts at San Remo, Italy’s Marina di Portosole. 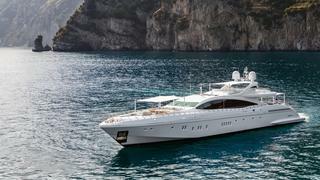 This big express cruiser yacht, to date the largest in Overmarine Group’s Mangusta line of “maxi opens”, has dock appeal. A crewmember deploys Moonraker’s passerelle, which slides out of the starboard side stairs and angles down, hovering a metre or so above the dock. Captain Matt Ploof touches a button to adjust its height and invites me onto the capacious aft deck, floored by blond teak planks and divided into a comfortable lounge and a dining area. There is ample room to move around on this luxury yacht and the wide side-decks offer great sightlines past the shapely superstructure. This Mangusta 165E superyacht (E for “evolution”), launched February 2014, succeeds the owner’s previous Moonraker yacht, a 36.6 metre Norship that once set the record as the world’s fastest yacht. That boat hit a top speed of 66.7 knots – a frankly insane pace for a vessel of its size. This latest yacht to carry the Moonraker name would lose out in a straight drag race, but she is carrying a lot more heft in its 49.9 metres LOA, making its top speed of just over 46 knots a very impressive achievement and arguably, pound for pound, the meaner machine. 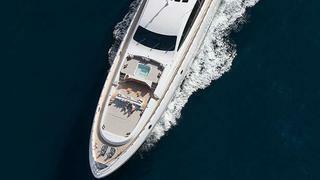 The owners and their broker Terry Smith looked for an opportunity on the brokerage market, but just as they had exhausted all options, Overmarine told Smith a building slot was open for superyacht hull No 8. The owners could put their personal stamp on a new Moonraker, designing it to entertain and travel frequently with their children and a close-knit crew. They might also offer her for charter. After unveiling the first Mangusta 165, Salvaje, at the 2007 Monaco Yacht Show, Overmarine Group made few visible changes to its flagship – until now.Moonraker shows changes of considerable magnitude that nevertheless blend well with the original Stefano Righini lines. For example, seemingly continuous main deck windows port and starboard replace the signature teardrop windows found on other Mangustas. In keeping with the owner’s perception of sleekness, Moonraker‘s flybridge was restyled, creating a better flow with built-in deck furniture. At the centre of this level is a bar clad in attractive mosaics. It separates the well-equipped helm station and three helm seats from a large built-in aft lounging area, which is well integrated into the superyacht structure and topped with a discreet radar arch – another redesign. “This design means the view of the stern is now more muscular, more powerful and aggressive,” says Isabella Picco, chief communications officer for Overmarine. At first, the company’s design team objected to styling changes to its flagship. But Overmarine’s CEO Maurizio Balducci had wanted to build a boat to American standards and when he began referring to the project as the 165 Evolution everyone was won over. In fact, the new windows and flybridge, the blond decking and new bridge design seen on Moonraker will now be offered to clients. In another departure from the classic Mangusta luxury yacht layout, Ploof had the helm of Moonraker enclosed behind a bulkhead. This allows him to run the yacht after dark from the interior helm, while guests may linger in the dining area or saloon that take up the rest of the main deck interior space. At the heart of the custom glass bridge are the controls for the latest generation Rolls-Royce Kamewa waterjets and the triple MTU 16V 4000 M93L engines that give this thoroughly equipped superyacht her immense speed and manoeuvrability. She reached 46.5 knots during sea trials, far more than the officially stated top speed of 38 knots. Ploof, who has years of experience handling jet boats, likes to run Moonraker at 33 to 35 knots, saving about 397 litres of fuel per hour compared to when the engines are wide open. “She handles great, like a giant jet ski,” he says. The main deck entertainment area has plenty of headroom and natural light from the side windows and five skylights over the dining table. It’s a very individual and heavily customised space, to the point that you easily forget that Moonraker is hull eight of a series. The contemporary décor blends the elegant greys of painted oak flooring and the coffee table’s shagreen top with solid black, white, chrome, lacquered woods and light-coloured veneers, such as a custom-finished pamu. The focal point of the saloon is a 3D piece in acrylic by Toronto artist Marc Littlejohn, which changes colour. 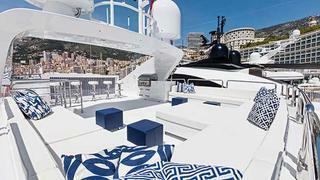 Another eye-catching feature of this superyacht is the bar running along the saloon’s port side that is topped with tiger’s eye marble. Moonraker‘s bar hints at the owner’s love of entertaining, but the two low Plexiglass-and-chrome wine cases flanking the large custom dining table, shout it. They each hold up to 48 bottles. Panels in painted glass framed in chrome conceal perfectly organised storage space and a cigar humidor. Meanwhile, a section of the bar lifts up to reveal a shelf holding fine liquors. This will be an invite to savour. 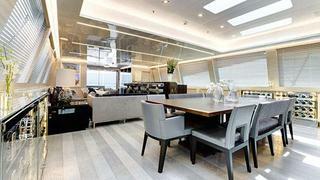 The lower deck is divided into cabins for the superyacht owners and guests forward and crew quarters aft. Guests are treated yet again in the shape of “emotional showers” that offer mood lighting and aromatherapy. The full-beam master suite with its broad bathroom is amidships, while three spacious en suite guest cabins with queen-sized beds are forward. 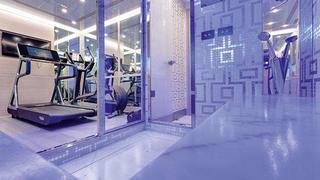 An extra cabin can be created from the cinema, which is situated opposite a gym and dayhead with shower and steam room. 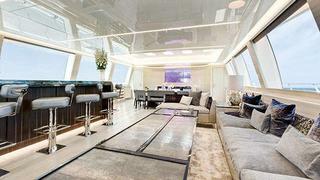 It’s above deck, though, where Moonraker really shines. From the forward spa pool to her bathing platform featuring her teak logo, this Evolution is a sight to behold. So much so that her owners and captain have been able to, in Ploof’s words, “put the old Moonraker in the rear-view mirror”.